Safety Lessons are geared for kindergarten through 4th grade. It focuses on everything from stranger safety, pedestrian safety, bicycle safety, seat belt safety-- to how to handle conflicts without violence. Internet safety is also covered in these safety lessons. These events are provided for such groups as the Boy Scouts, Girl Scouts, churches and civic groups. Children bring their bikes and helmets and officers lead them through fun and exciting obstacle courses. Officers focus on bike safety equipment, safe riding techniques, and bicycle laws. 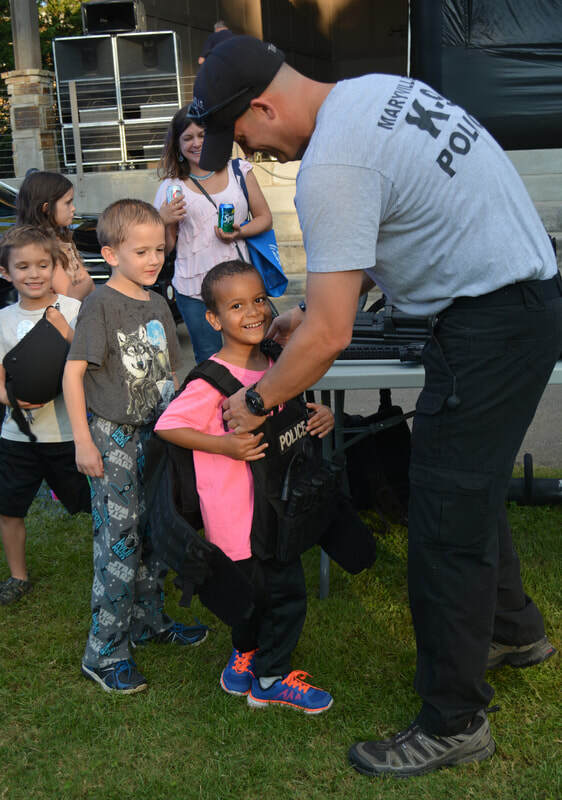 Officers visit elementary schools and local daycares to give the younger children safety information and allow them to interact with officers. The main focus is letting the children know that police officers are their friends and will always help them. The police department is excited to be able to provide this service to our community. Upon request, officers from the Community Oriented Police (COP) Unit will set up tours for groups that wish to see the inside of their police department. The groups visit the many areas that make up the police department and officers explain their responsibilities in each. Outreach programs designed to educate citizens of the community on an array of issues including self defense and community issues. RAD is a 12-hour self-defense course for women. The program is designed to teach women self-defense options. The course stresses the importance of mind set and awareness.This is a very empowering experience for many women. This 8-hour course is designed to help senior adults become more aware of the aging process and how it may affect their ability to operate a vehicle. It also provides these drivers with ways to compensate for these changes and updates them on any new changes in the law. Community Watch is a citizen involvement program in cooperation with the police department. Citizens directly participate in the detection and prevention of crime. Community watch participants stay well informed about their community and of any suspicious, criminal or dangerous activities that may be occurring. It is stressed to participants that it is their job to be a good witness. Our role is to assist with the creation of the group and provide support. Officers provide these groups with information on general safety issues, crime prevention, personal safety, identity theft, scams and any other requests. Officers will conduct security surveys for businesses as well as private citizens. Officers check for potential areas that could be vulnerable to intruders and make appropriate recommendations to reduce the opportunity of becoming a victim. The police department is excited to be able to provide this service to our community. Upon request, officers from the COP Unit will set up tours for groups that wish to see the inside of their police department. Group visit the different areas that make up the police department and officers explain their daily responsibilities. This 12 hour class is designed to enhance young driver’s awareness of the task of operating a motor vehicle and practice skills that will prepare them to anticipate and handle hazards that may occur while operating a vehicle. This program deals with how to handle disgruntled employees and provides employers with ways to ensure a safe working environment for all employees. This program is designed to inform management as well as general labor personnel of the effects of substance abuse in the workplace and what signs to look for.